Tomorrow’s Lawyers (2013) is Professor Richard Susskind’s latest book about the future of legal services, wherein he predicts that legal markets will be further liberalized, with new jobs, and new employers, for lawyers. Tomorrow’s Lawyers (2013) is very much about WHAT we can expect the role of lawyers to be like in a very different legal landscape where Professor Richard Susskind envisages it is set to change more radically over the next twenty years than over the last two hundred. EntrepreneurLawyer review: “The Age of UnLawyering” … COMING SOON !!! The Naked Lawyer (2010) is the first in a series of books by Chrissie Lightfoot. The Naked Lawyer is very much about HOW lawyers of all types will succeed in this radically different legal world, in particular, The Hybrid Lawyer, which Richard Susskind identifies in Tomorrow’s Lawyers (2013). The Naked Lawyer is recommended and mentioned in Tomorrow’s Lawyers along with only a handful of select books as the go to literature on the future of legal services. 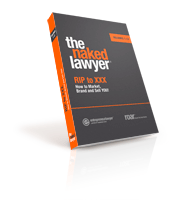 The Naked Lawyer – A 2011 to 2014 best-seller and still in demand! If you haven’t got your copy yet – now is the time! Professor Richard Susskind, OBE; strategic adviser to major professional firms and to national governments; author of ‘The End of Lawyers? Rethinking The Nature of Legal Services.’ And ‘Tomorrow’s Lawyers’,UK. Stephen Mayson, Professor of strategy and Director of the Legal Services Institute at the College of Law; strategic adviser to legal services businesses; author of ‘Law Firm Strategy: Competitive Advantage and Valuation.’ UK. Andrew Shaw, Partner & Global Legal Strategy Leader, PricewaterhouseCoopers Legal LLP, UK. Jeremy Kennedy, WHS Lawyer & Partner, McCullough Robertson Lawyers. Australia. Bob Burg, Best-selling author of ‘Endless Referrals’ (250,000 copies sold worldwide),USA. * College of Law (London, UK) LNTV Core Programme 5650 – Practice Management & Compliance: Branding, Social Media and Networking (co-contributor with Eversheds Managing Partner).